Just Say “Merry Christmas” in July! Just say Merry Christmas in July?? It’s hot? Especially out here in dry West Texas. Get The Podcast for this Post! We simplify the decorating process. As mothers we have the abilities to run around in a frenzied panic or plan and prepare for a less stressful holiday! We have podcasts you can download (give us a review when you download in iTunes) and blogs with great ideas to help you out this Christmas and Holiday season. 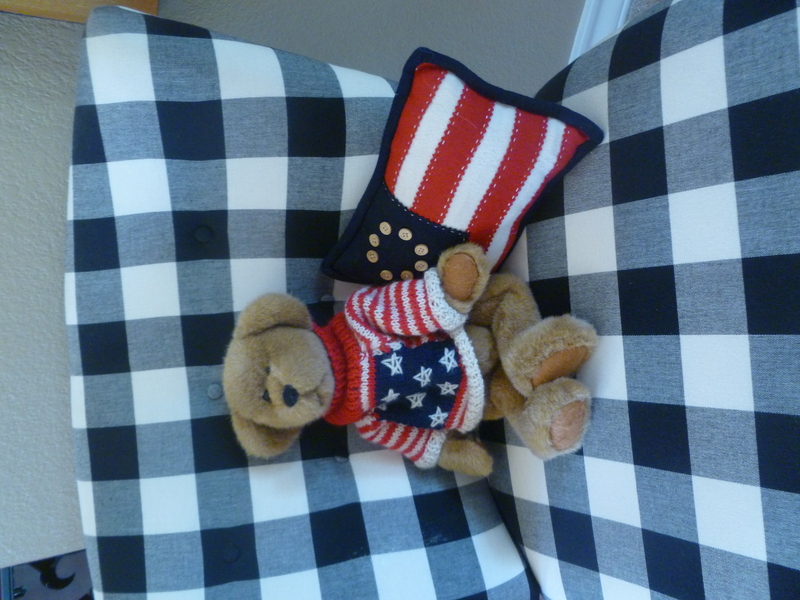 This also the week we celebrate the 4th of July! Happy Birthday America, “thank you” to the men, women,and their families who have served, are serving or have given the ultimate sacrifice defending this great country! God bless America and God bless Texas! With that in mind, our forefathers fought and died for America, for religious and personal freedoms! We have the right to say Merry Christmas! In recent times there has been an assault on even saying Merry Christmas which is kinda crazy when you consider these facts. Christmas Facts. (2012). The History Channel website. Retrieved 12:26, July 3, 2012, from http://www.history.com/interactives/christmas-facts. We are excited about all of the possibilities the radio show has to offer, one of which is voicing our view about Christmas and the assault on celebrating Christmas and removing much of the symbolism as organizations and the government deems politically incorrect. With that said we do not have a political show, we are women entrepreneurs, the Christmas Decorating Experts with big hair and big smiles, not to be confused with big Texas women! We invited our guest Dr. Jim Gerlach on the show to help us understand the history of Christmas and the traditions we celebrate. 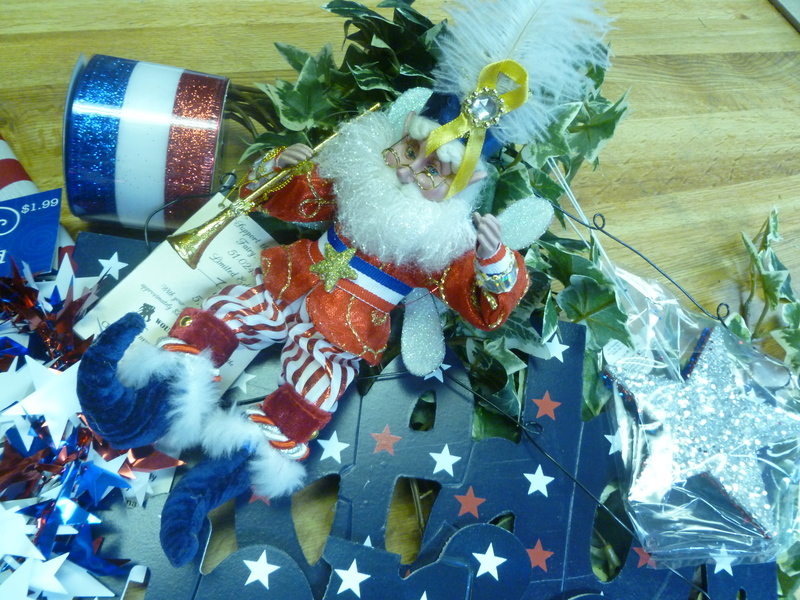 Over the next couple of weeks we will dig deeper into many of the decorations and symbols of Christmas. We will have lots of tips and how to ideas for you to use in your own home! Jim shared in his family, traditions and customs that they celebrated as kids with a mission offering on the tree. The offering helped them focus on giving rather than receiving and it is a tradition he and his wife Tashia carry on with their kids Matthew and Annalise. 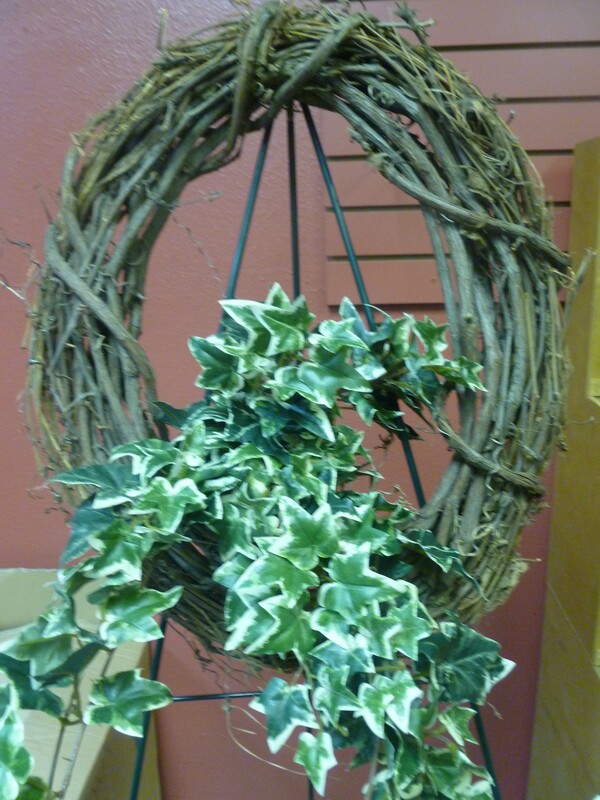 As Isaiah prophesied the birth of Christ, the holly wreath, which originated in Germany, was said originally to have prophesied why Christ came to earth. 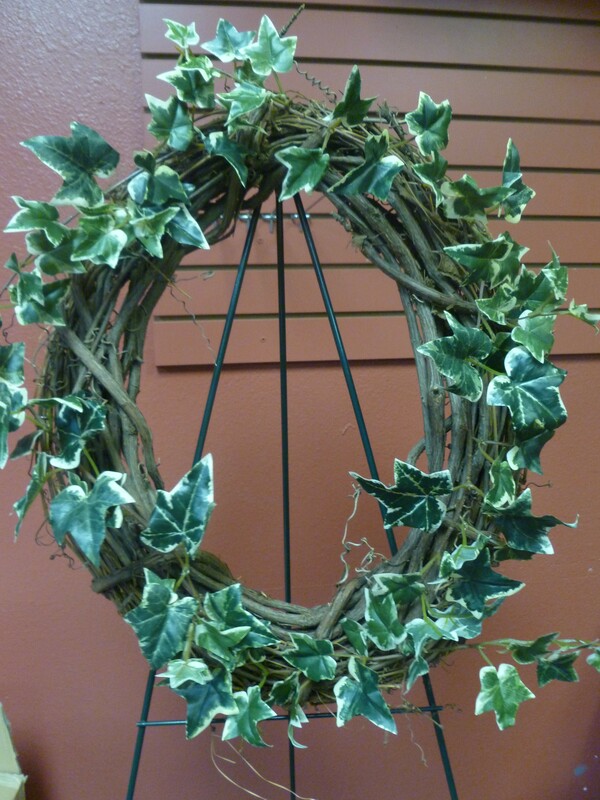 In Germany the holly wreath is widely called the “Christ-thorn” because of the prickly points on its leaves, and has come to represent the crown of thorns Christ wore to the cross. Angels played a part in that first Christmas and have been used for generations to top Christmas trees and decorate our homes during this holy season. Each year at Christmas millions of mantles and tables are adorned with beautiful nativity scenes. Traditional reasons why we give gifts at Christmas abound. 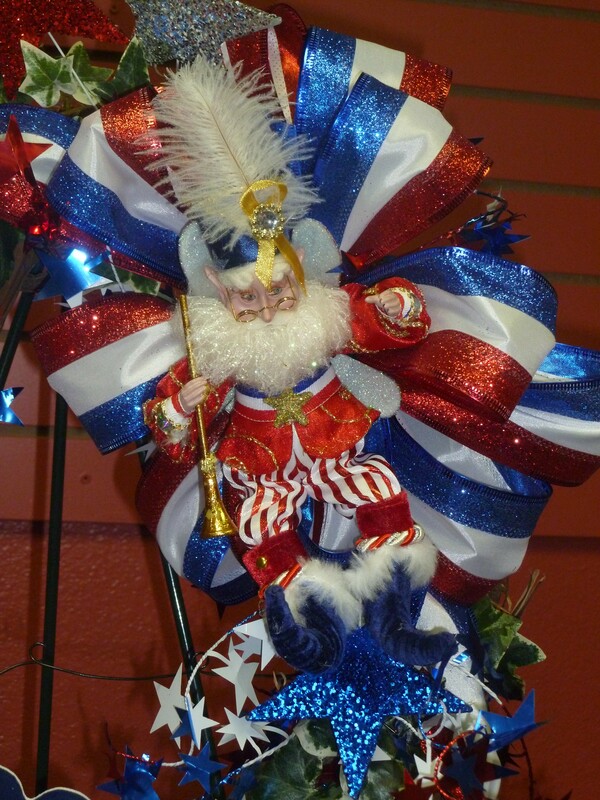 Some revolve around the various legends of Santa Claus & St. Nicholas. To Christians, giving gifts symbolizes the ultimate gift of all, the giving of eternal life through His Son by God the Father. The gifts the Wise Men gave Christ child indicate they knew the significance of His presence on earth. The Christmas tree originated in old German paradise plays and was introduced into this country by German settlers in the eighteenth century. Its original German meaning was completely spiritual. It represented the tree of paradise, and was hung with apples and ringed with candles to represent the Garden of Eden. Atop the tree represents the star that guided the Wise Men to Bethlehem. The lights on the tree originated with the lighted tree of paradise. Finally, like the holly, the evergreen Christmas tree symbolizes the everlasting life Christ provided at the cross. 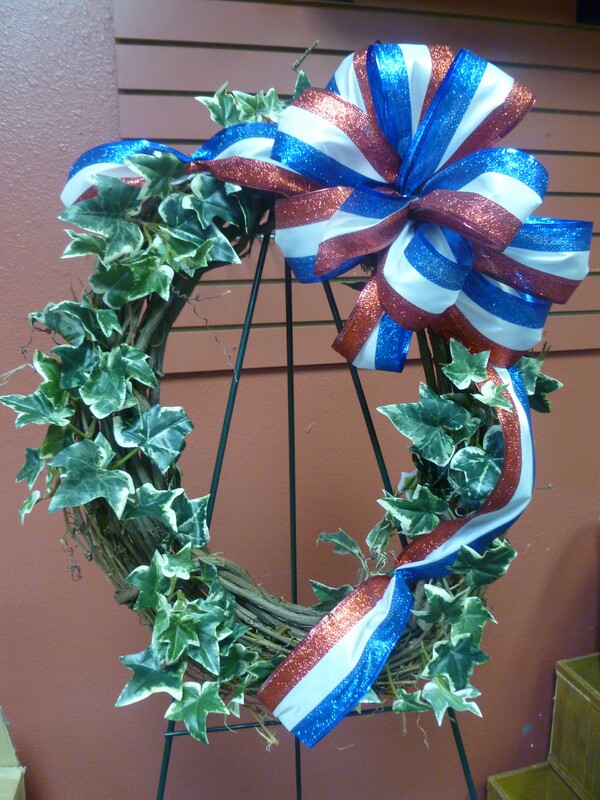 It is our hope at Miss Cayce’s Christmas Store and Show Me Decorating that as you decorate your home for the holidays this year, the season will have greater meaning to you and your family! We are asking our listeners and Facebook friends to send in their family traditions and ways they celebrate Christ birth. They include the true meaning of Christmas. We will pick traditions to share on the radio and send you a free Miss Cayce’s shopping bag and surprise! 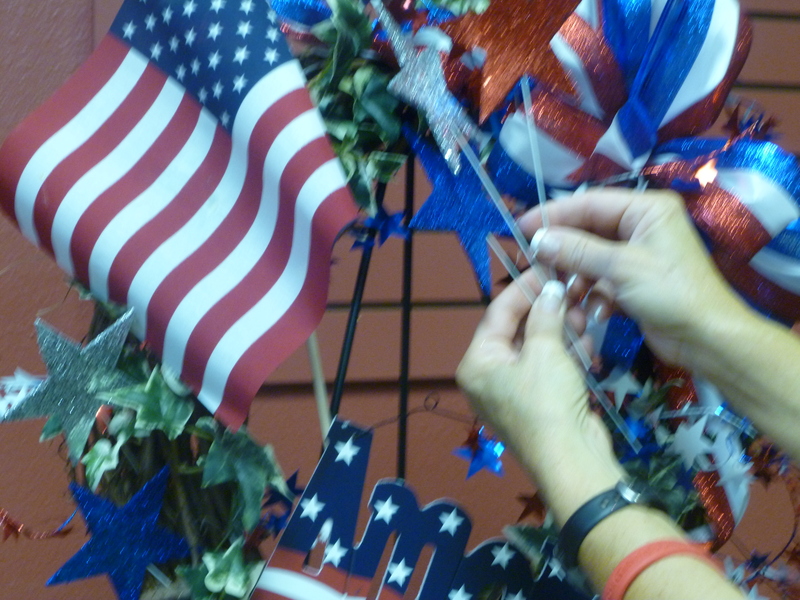 Show Me America’s Birthday decorating! She’s a grand old flag……nothing says FREEDOM like the American flag! My front door is ready to welcome all who come by! Decked out in red, white and blue. Now here’s the step by step! 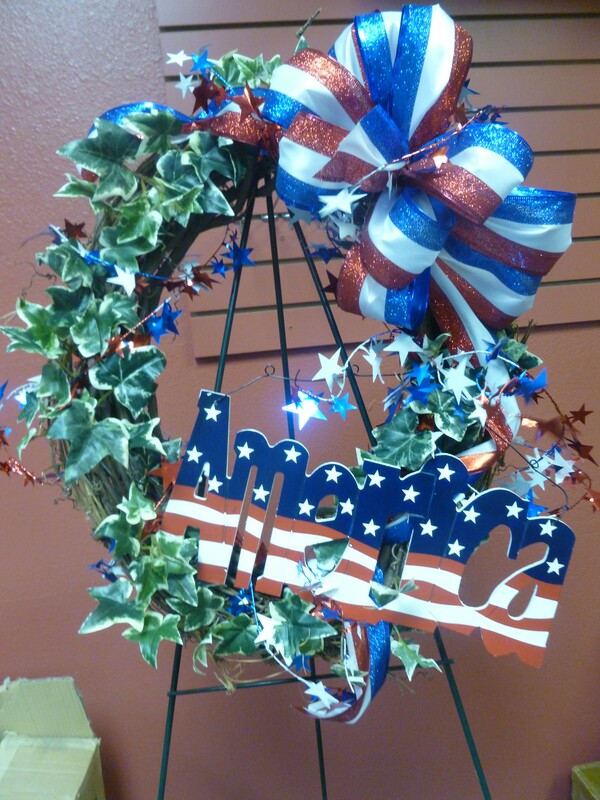 Create, inspire, educate ….. to decorate! 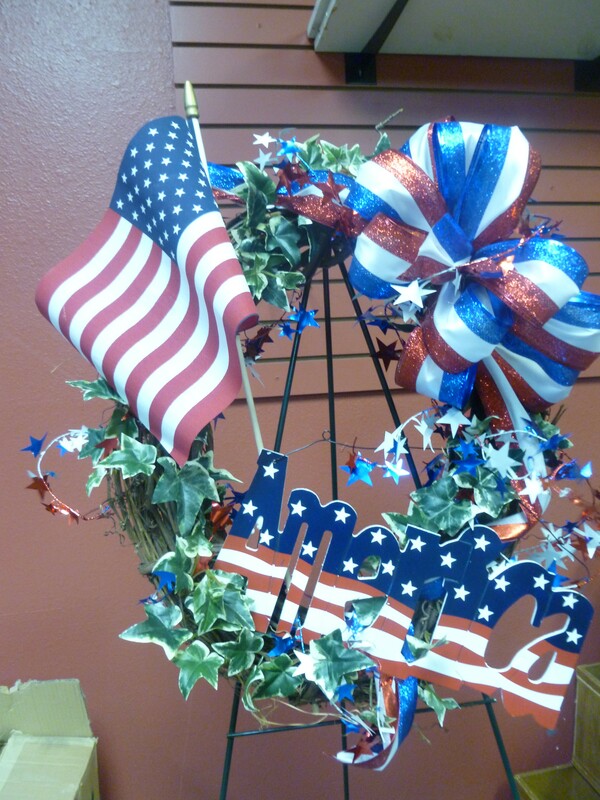 Let us celebrate this special holiday and thank all of our brave men and women who serve to keep us free and safe! “Show Me” some 4th of July Celebrating! 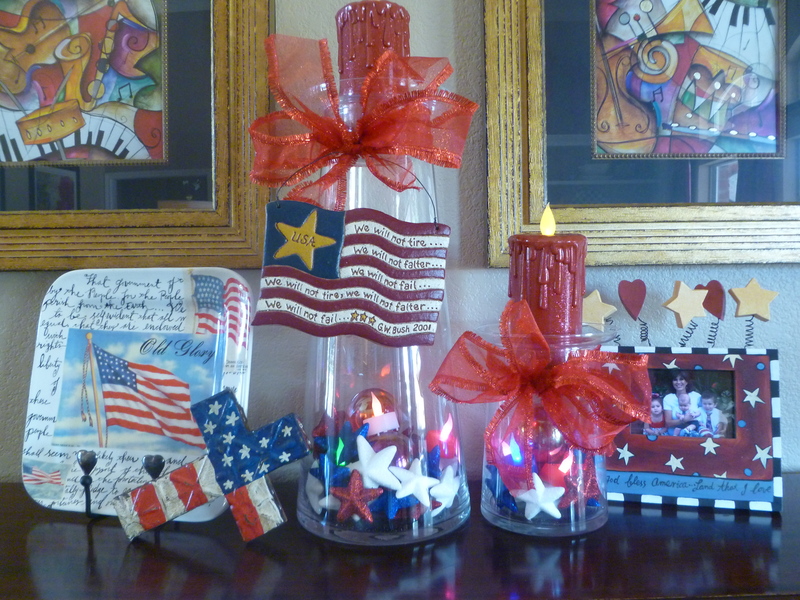 Candle Jars in Red White and Blue! The piano top is my favorite place to change out seasonally! 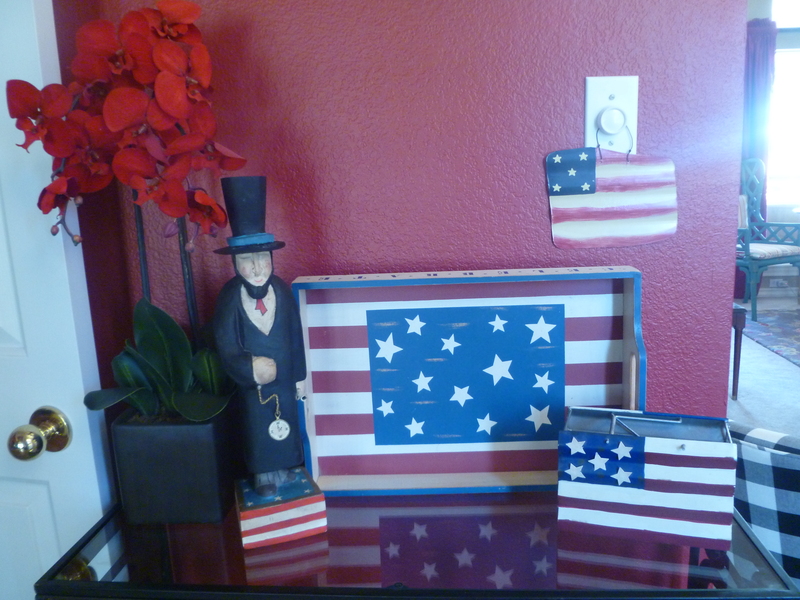 I love patriotic goodies and have collected flags for years! I love using my clear glass candle jars but you could always use clear glass vases or containers to achieve the same effect. 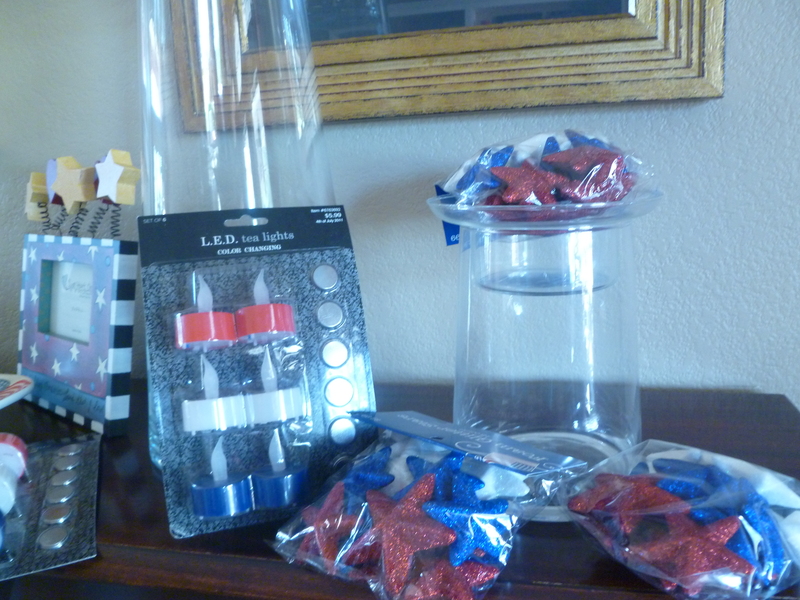 Empty candle jars and supplies! After a visit to my local Hobby Lobby (everything was on sale!) I gathered all my supplies to complete the display. 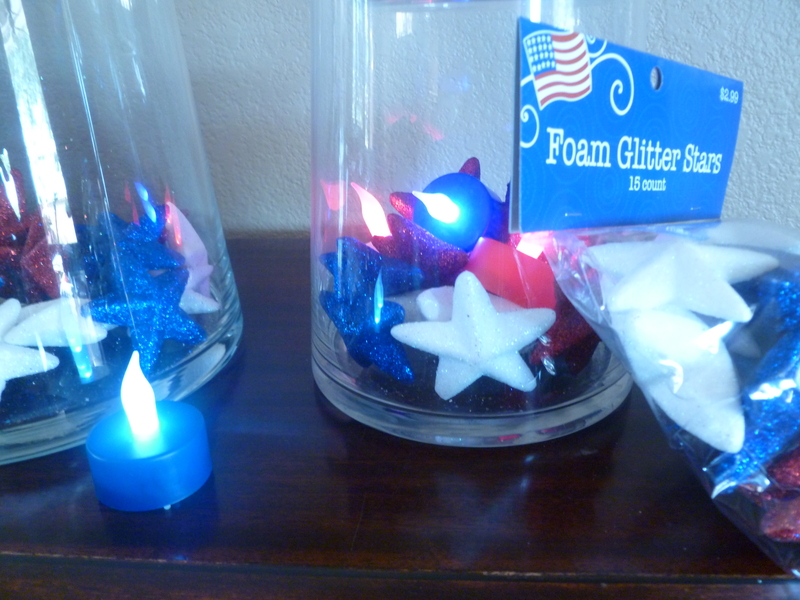 The red, white and blue tea lights reminded me of firecrackers and I love the sparkly stars. I even dug in my valentine box to recycle my red bows and some of the clear red plastic balls. My red candles are from Christmas (fun to repurpose) and the red bows add a finishing touch! 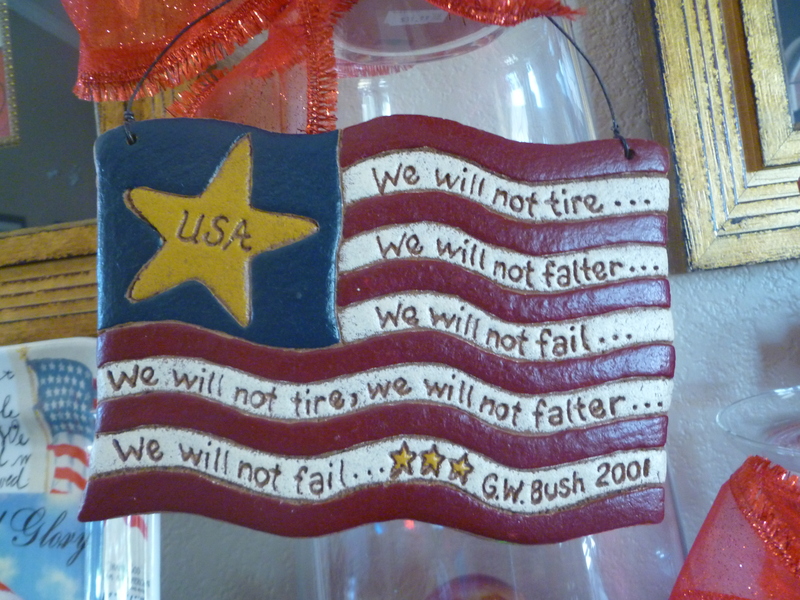 George Bush quote, a special keepsake! It is hard to believe it has almost been 10 years since 9-11. Thank God for our military and the brave men and women that serve to keep us FREE and safe. 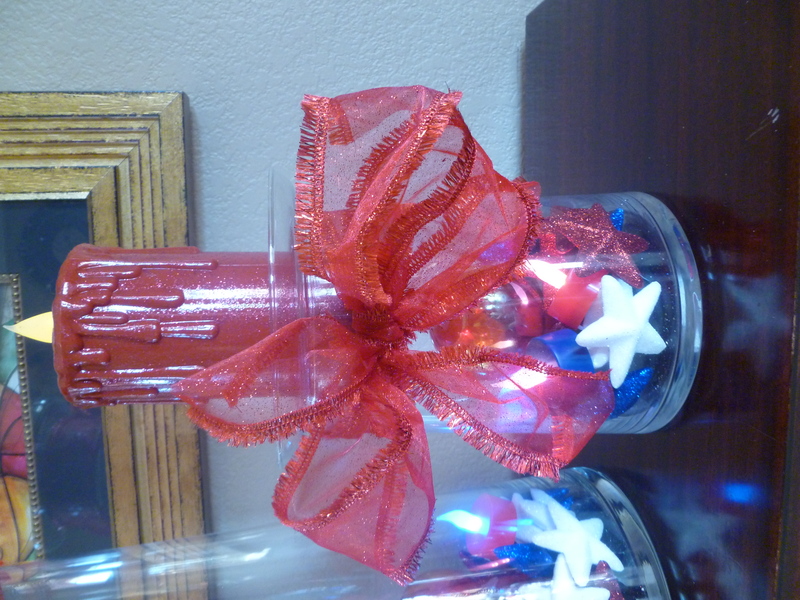 I love to add touches of the celebration around the house too! Teddy bear all dressed to celebrate! Abe Lincoln the father of Freedom! 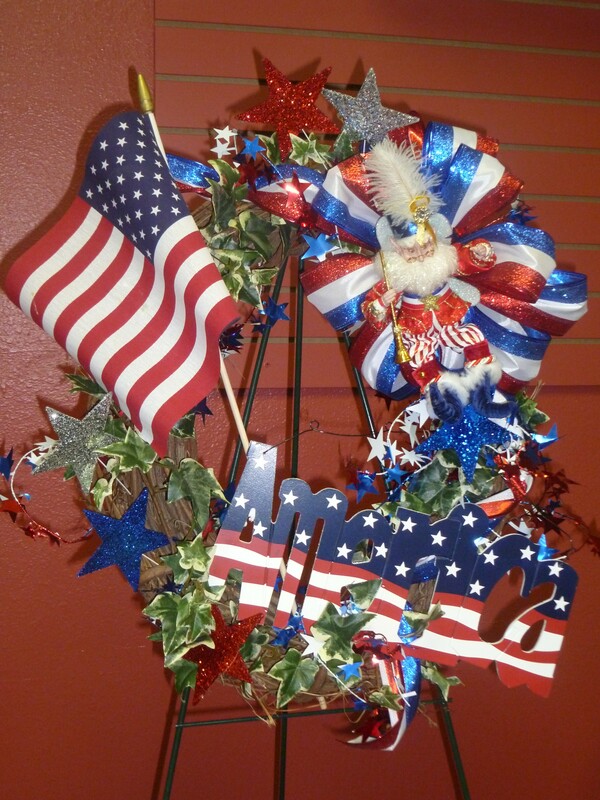 Happy Birthday America, the land of the free and the home of the brave….. one nation under GOD! 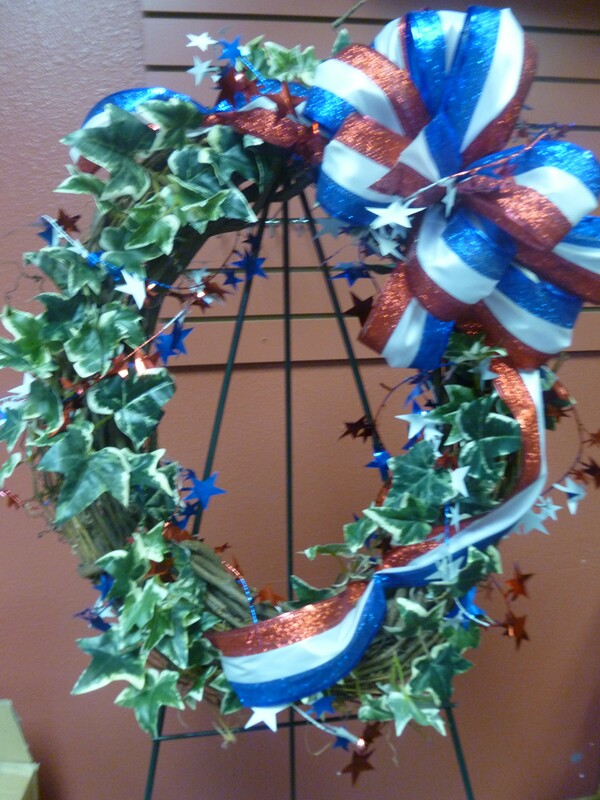 Create … inspire….educate….to decorate! Let’s celebrate!